The Conservation Foundation was asked to help facilitate an update to the original Tyler Creek watershed plan, developed in 1996, to meet new criteria for Watershed Based Action Plans developed by the Illinois Environmental Protection Agency. The plan update was completed in 2007. The Foundation is working in partnership with the Kane DuPage Soil and Water Conservation District to continue outreach efforts. The Tyler Creek Watershed Coalition is comprised of watershed stakeholders who are committed to work together to preserve and protect the water quality and natural resources of Tyler Creek, a tributary to the Fox River in Northeastern Illinois. 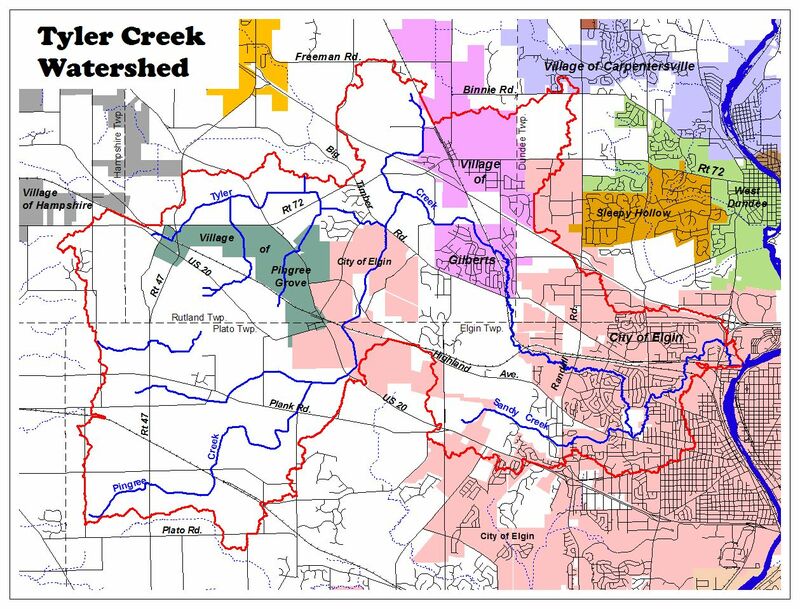 Their mission is to bring together a diverse coalition of stakeholders to protect the unique and irreplaceable natural resources of the Tyler Creek Watershed through cooperative partnerships, smart land use decisions and sensible growth. For more information about the Coalition and the watershed plan please visit their website at http://www.tylercreek.org/.